These Spritz cookies are tiny little hearts with big flavor. Spritz cookies are traditionally made during the winter holidays as a splurge but we have transformed them into our Valentine treats. For Spritz cookies the dough is put into a cookie press and different shapes can be easily made. These Spritz cookies are tiny little hearts with big flavor. Spritz cookies are traditionally made during the winter holidays as a splurge but we have transformed them into our Valentine treats. For Spritz cookies the dough is put into a cookie press and different shapes can be easily made. If you don’t have a cookie press these flavorful treats are just as delicious dropped on a cookie sheet. 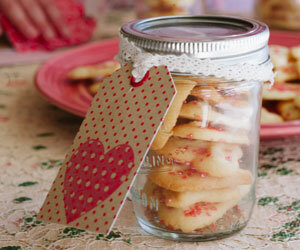 For an easy fun Valentine gift, stack the cookies in mason jars and tie your valentine message to the lid. Preheat the oven to 375 degrees. Sift together the flour, sugar, and baking powder into a medium size bowl and set aside. Be the butter with the electric mixer on medium to high speed for 30 seconds. Add half of the flour mixture, egg, vanilla, and almond extract if desired. Beat until thoroughly combined, beat in remaining flour mixture. Load un-chilled cookie dough into a cookie press with the heart shaped cutter, press onto ungreased cookie sheet. Sprinkle with sparkling decorative sugar and bake in a 375 oven for 8 to 9 minutes, or until the cookies are firm but not brown. Cool cookies on a wire rack. When the cookies are completely cooled store them in an airtight container. Makes about 84 delicious buttery cookies!